Quick quiz: what comes from Australia? Not what lives there, what leaves there! Can’t think of anything? Nor can I, except wine and souvenir boomerangs. If one were to look on the bottom of most every manufactured item in our house, I wager none of them would have the word Australia. So we were truly amazed when on Saturday, drifting through the thrift shop next to the Mediterranean grocery store (nothing from Australia in there to be sure), my wife picked up an unfamiliar looking tin cylinder with lids top and bottom. 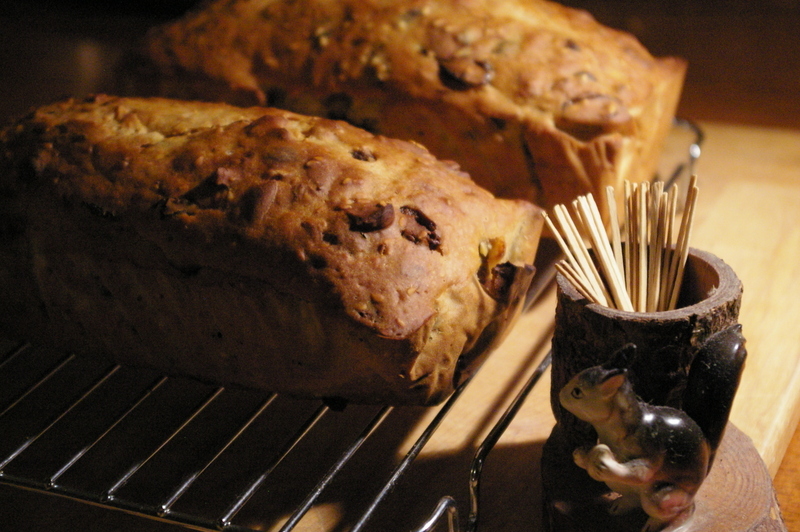 Fastened around the tin with a rubber band was a label bearing a recipe for nut loaf. 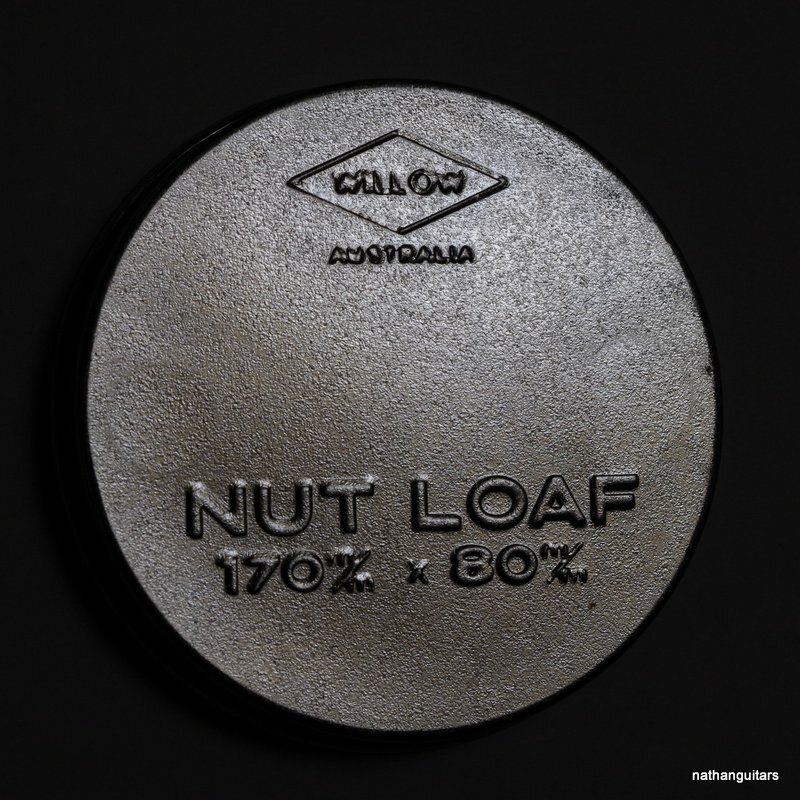 The lids were embossed with the trade name “Willow” and the word Australia, as well as “NUT LOAF” and dimensions in m/m, Australian for millimetres. A web search turned up the key to the mystery. Willow nut loaf tins were an Australian phenomenon, made to bake tiny nut loaves, usually two at a time according to the amount of ingredients in most recipes. 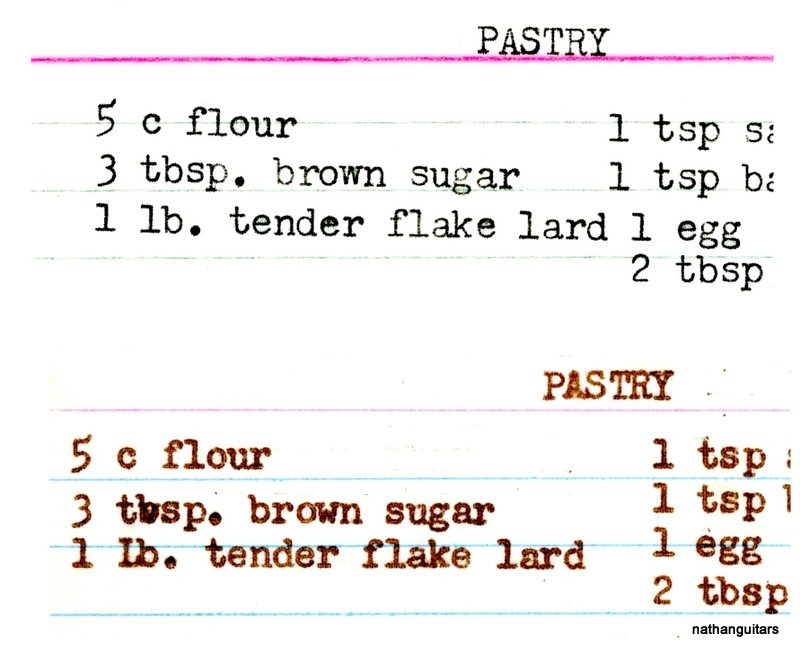 The printed recipe on the paper was in fact wrong, as it didn’t have the necessary sugar but instead had walnuts listed twice. Never minding this, we baked a nut loaf following the web sourced instructions. 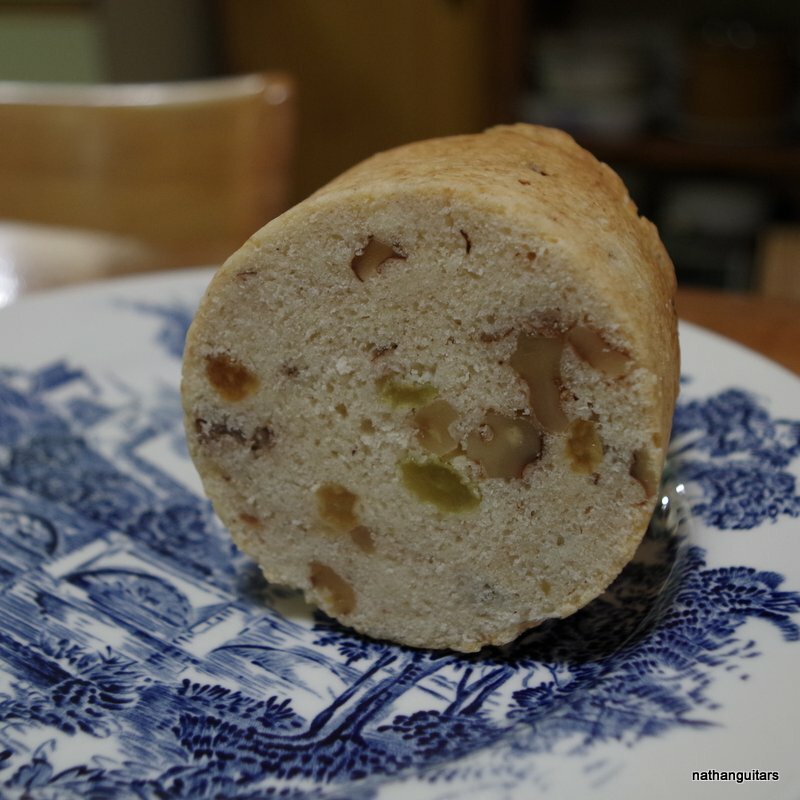 Surprise – it was excellent; the recipe worked to perfection. 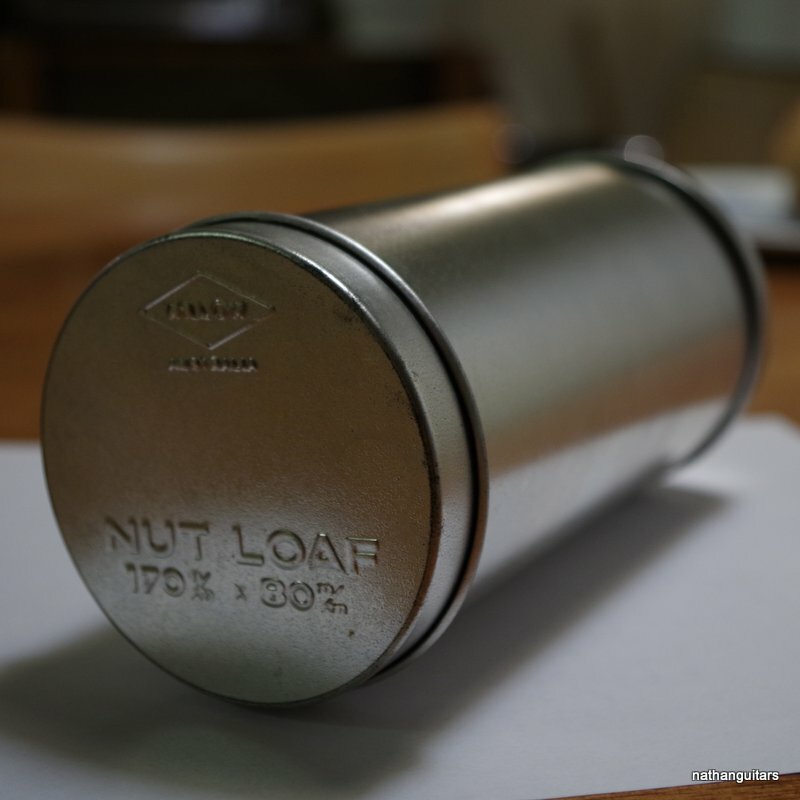 Sadly, the Willow Company no longer has a nut loaf tin among their many cooking tins. 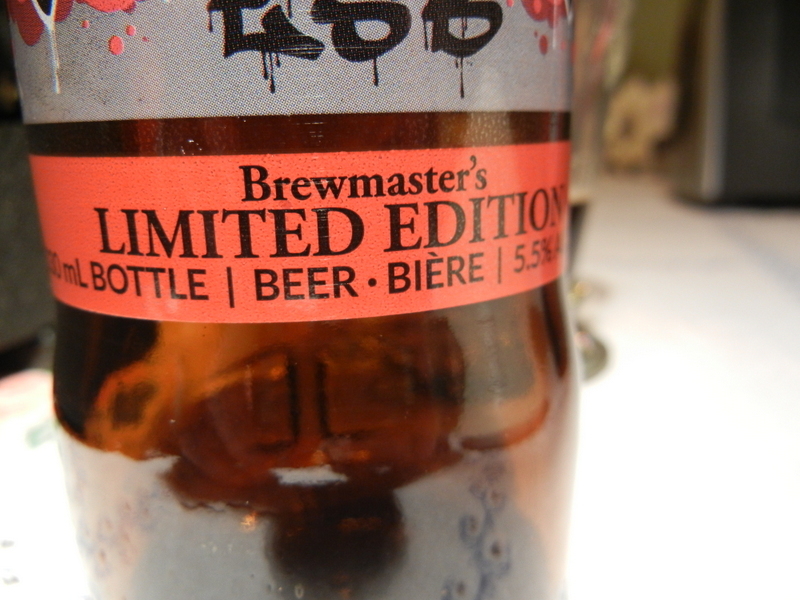 Perhaps this explains why this item is so rare, at least in these parts. 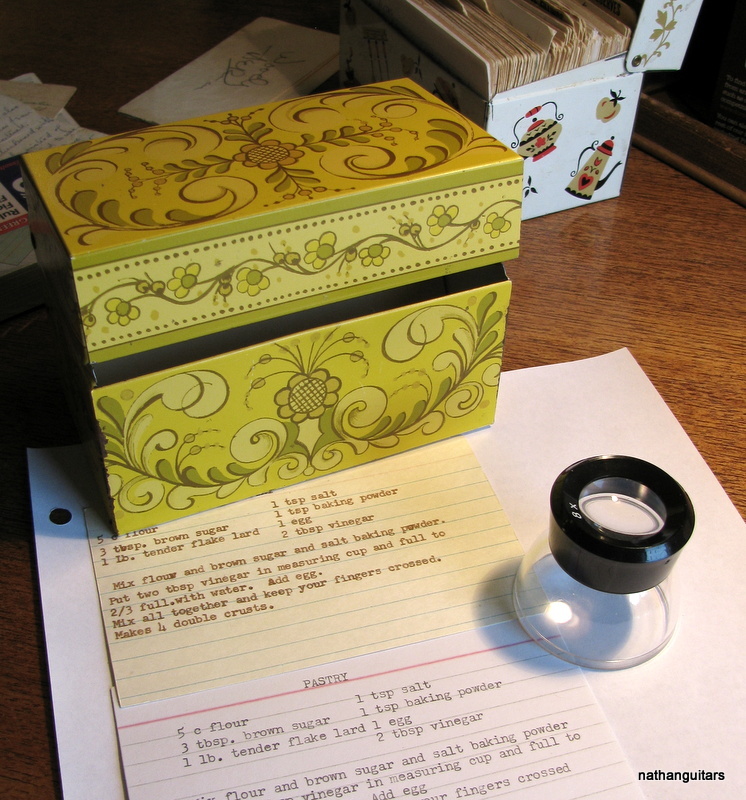 Neither of us had ever seen or heard of a nut loaf tin, and that would necessarily include mothers and grandmothers, too, proof positive of its rarity. Good luck finding one; I further wager it will be another lifetime before one of these turns up in these parts, especially in like new condition. There are some for sale out there, so if you’re curious and collect unusual kitchenware, go for it. But don’t go to Australia; they don’t make them there anymore! Have You Heard About the Herd? While looking through cards in the recipe box I recently found, I came across a few pieces of paper. One of them was folded into six and inside was a recipe for Baked Beans. What was more interesting however, was what was written on the back. Woody Herman’s autograph, in pencil! 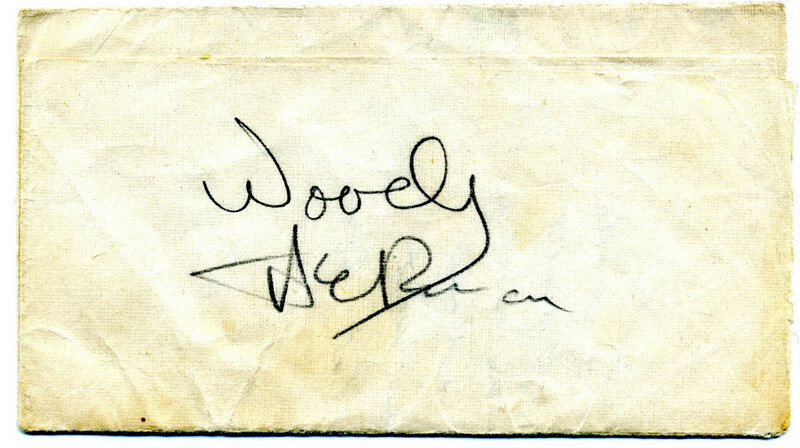 I had a look on the internet and it closely resembles a number of examples of Woody’s autograph, leading me to believe it’s the real thing. I simply can’t imagine why it wouldn’t be. 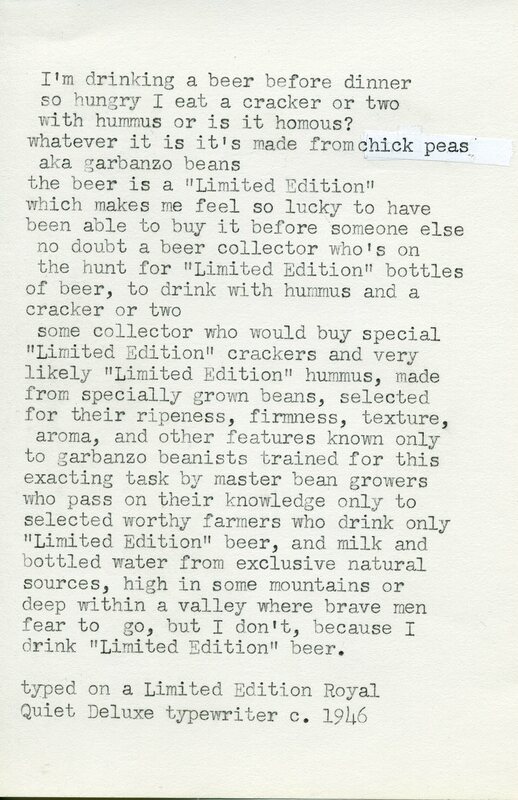 But why was it on the back of a baked beans recipe? 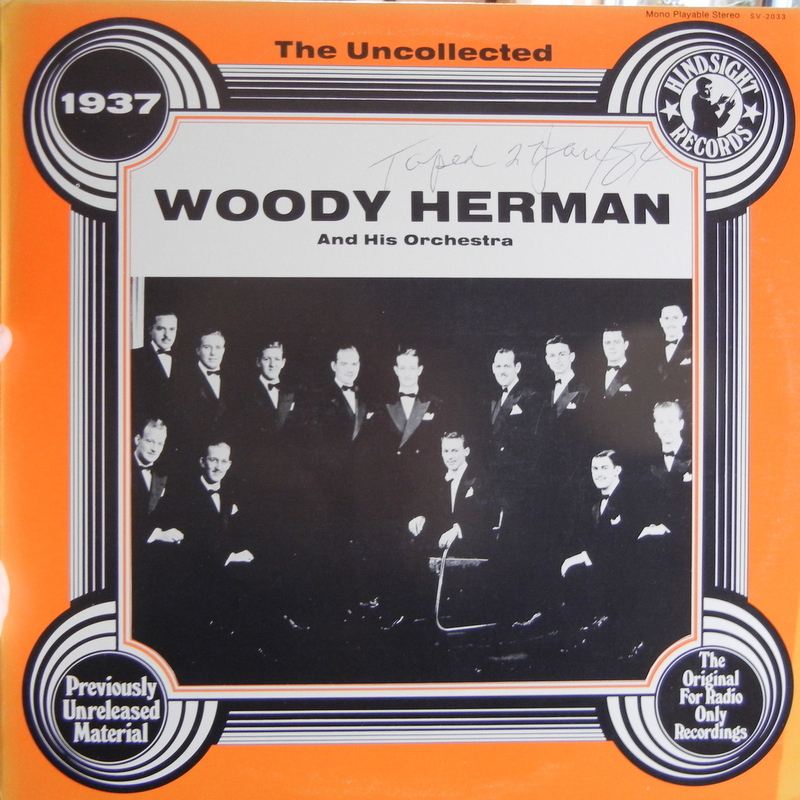 Here’s one of my Woody Herman LP’s, with many familiar classic swing era tunes. 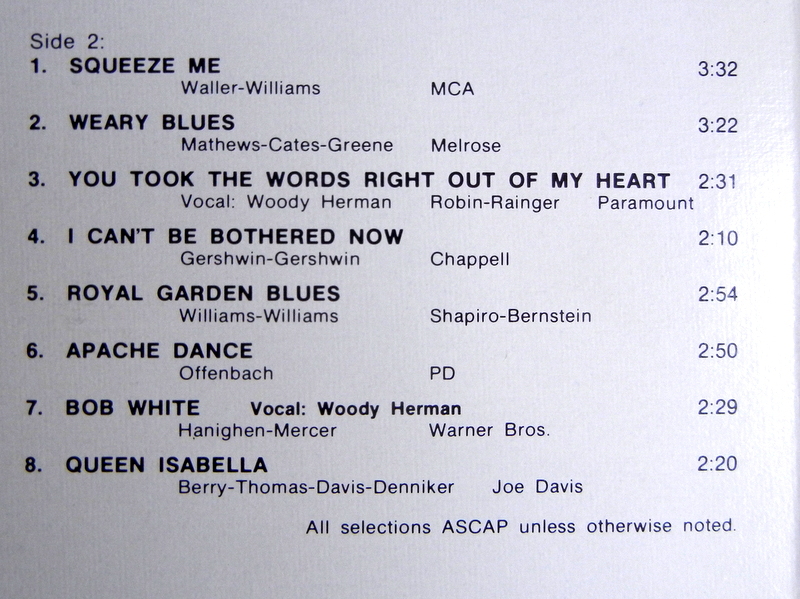 Woody was one of the top band leaders of the day, and once had Dizzy Gillespie as an arranger! 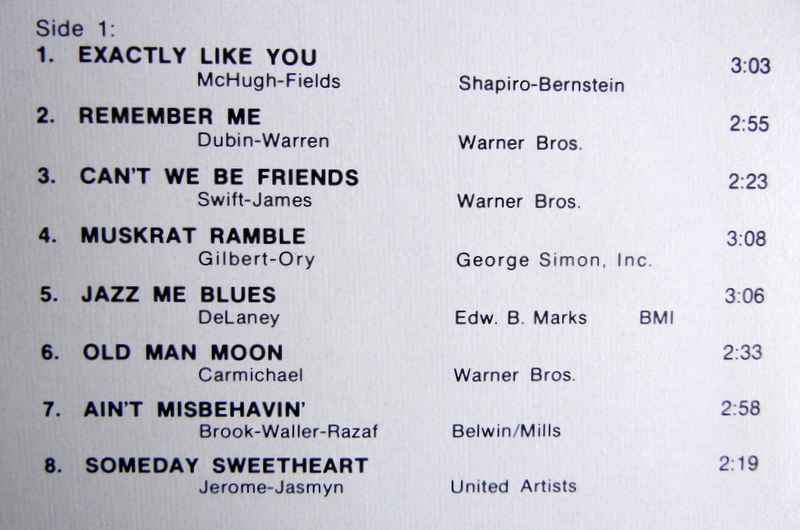 The first Herman band was known as The Band That Played the Blues, but later they were called The Herd. Once again I’m finding things seem to come in waves, and here is another example: I found my 2nd old metal card file box in as many days. 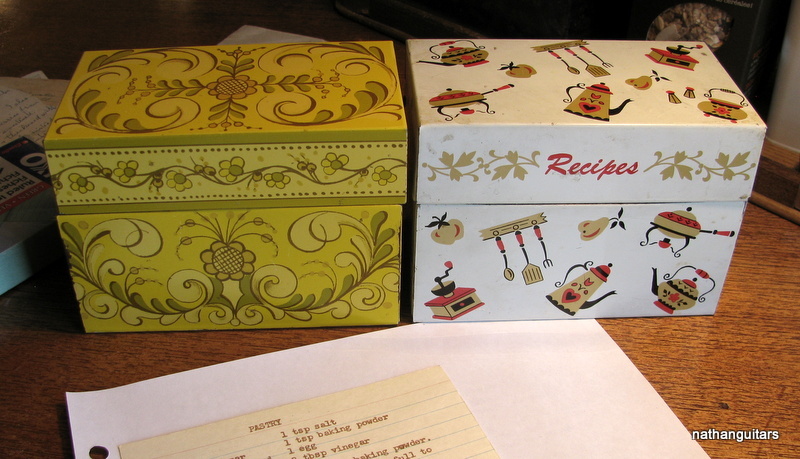 This time the box was empty, but nevertheless the same box with a different paint job. 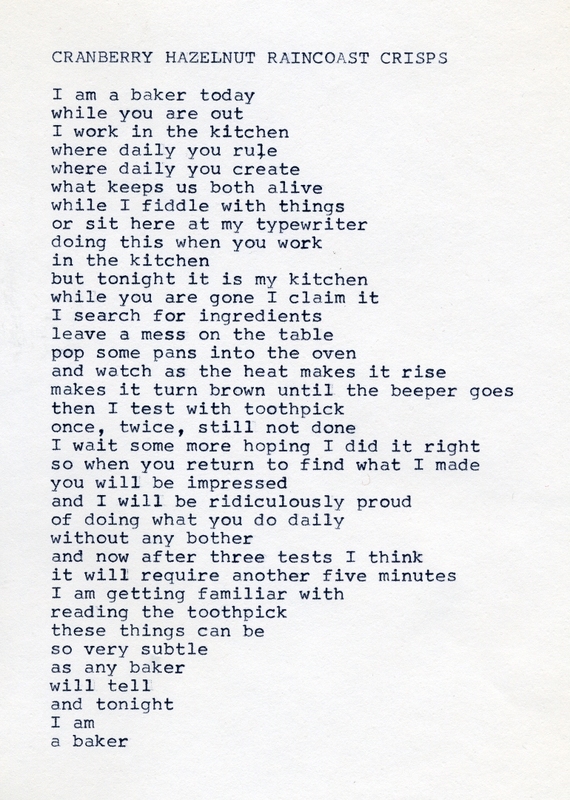 Meanwhile I’ve been amusing myself trying to discover the sort of typewriter that was used to type the pastry recipe on the index card I featured previously. I typed the same words using an old Underwood Golden Touch but that didn’t look like it, so I then tried with a 1948 model Royal Arrow. That looked very similar. Here is the direct comparison of the new card (Royal Arrow 1948) and the original card (unknown). The old ink is now brown, and it looks fatter, but that may simply be how it was absorbed by the paper when it was typed in the first place. 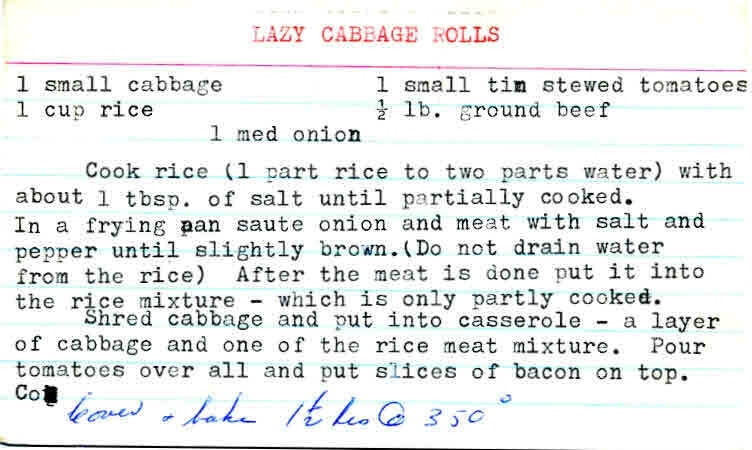 Going through the recipe box thoroughly I discovered a few more typed recipes, which I present here. 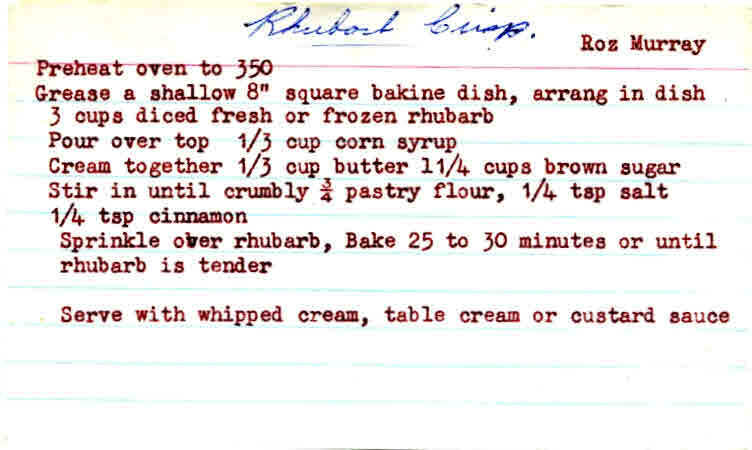 This next recipe comes from a different machine, at 11 characters/inch. My first guess would be a Brother, but it could well be an Olympia too, as they made plenty of 11 pitch machines. I have not investigated this typeface yet. 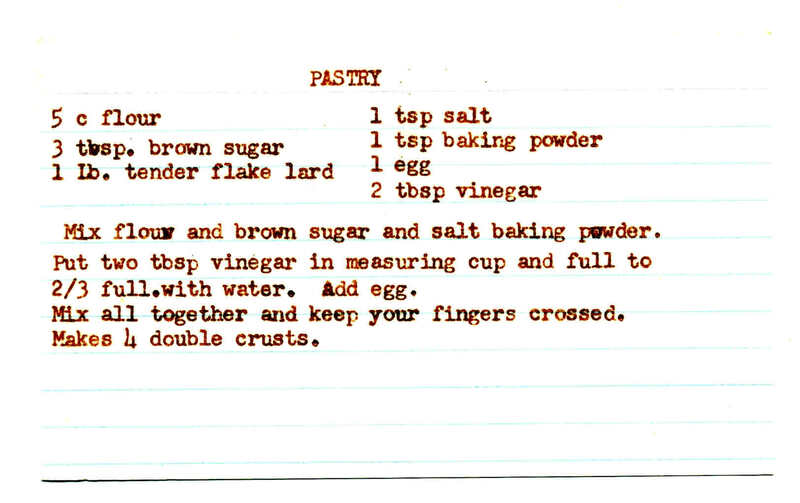 Back to the other typewriter again for a Mystery Cake. I’ve been looking for one of these for some time. My mother had one similar, but with a tartan pattern and beige brown lid. 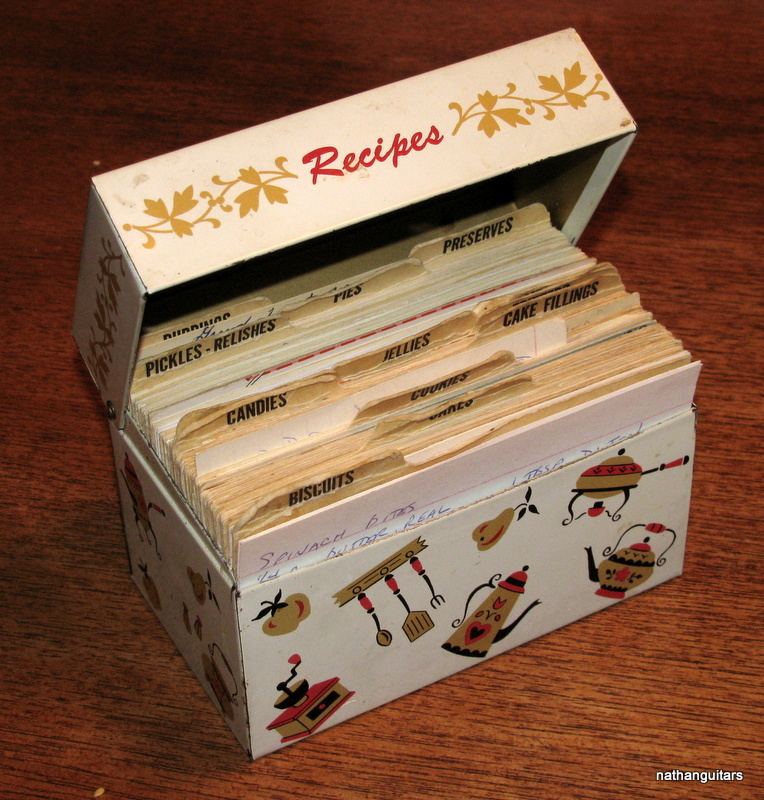 It too was stuffed full of mostly handwritten recipes. I venture this came from the 50’s, judging by the handwriting (tiny and perfect) and the business card stuck inside, which has a phone number that begins with letters (GR in this case). Having searched most of the cards I’ve only found one that was typewritten, and of course it is clear and easily understood. It looks to be elite (12 cpi), but from what machine? The stasi would have known these things! 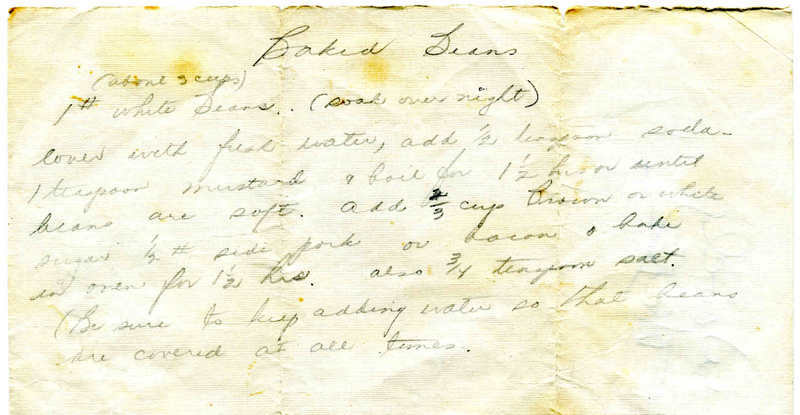 For those who might be making pies for the holidays, here is that recipe. Note the hopeful suggestion about fingers crossed. 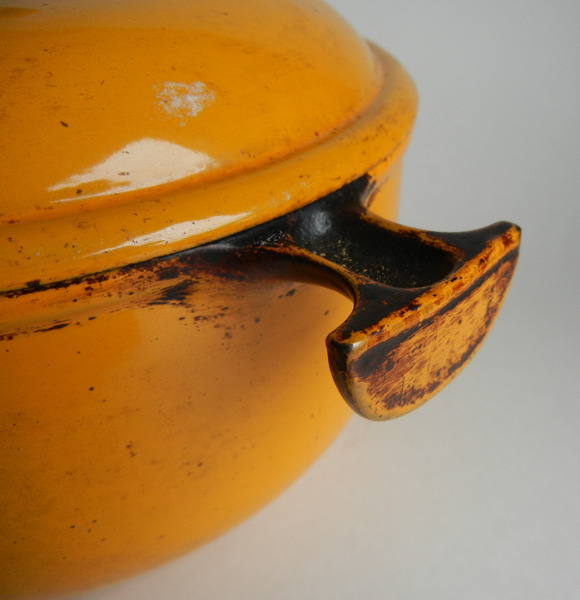 Last week I spied a very interesting enameled cast iron pot in the thrift shop. It was the perfect size for a small chicken. 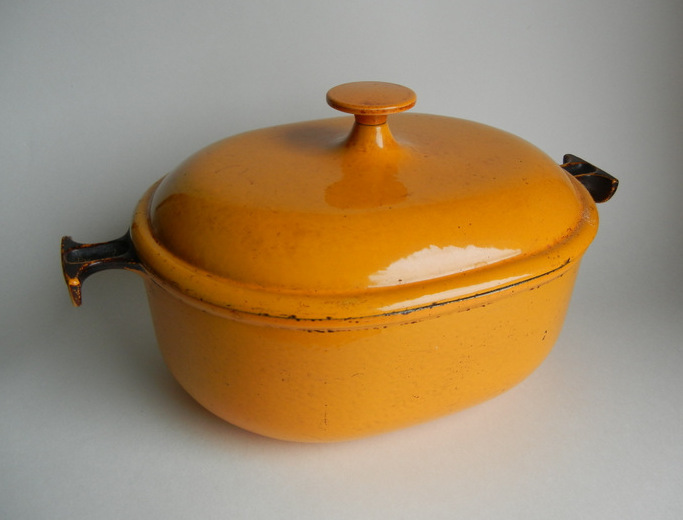 On the bottom it had the familiar stamp of Le Creuset, the famous French pot makers. 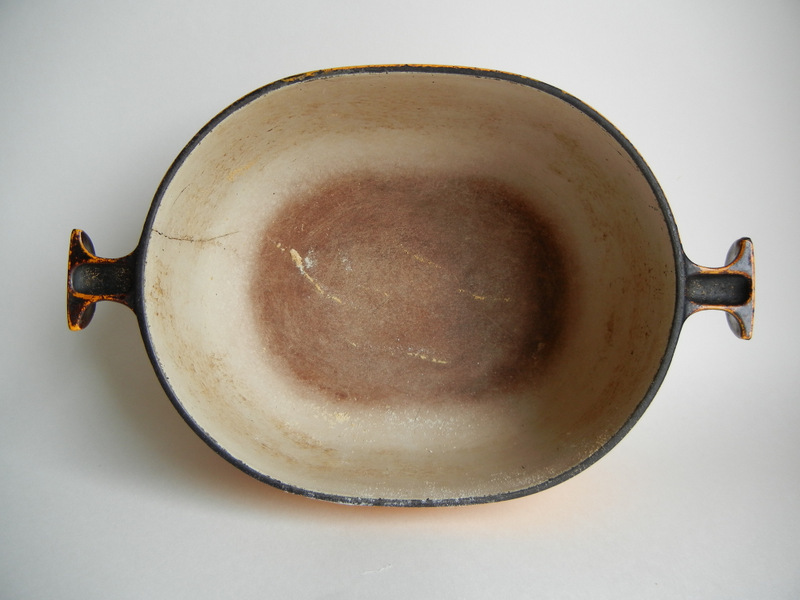 I brought it home and prepared to drop a chicken in it when I noticed to my dismay that there was a crack, which rendered the pot useless for holding liquids, thus ruling out chicken. Then it occurred to me that the pot was the right shape for bread. 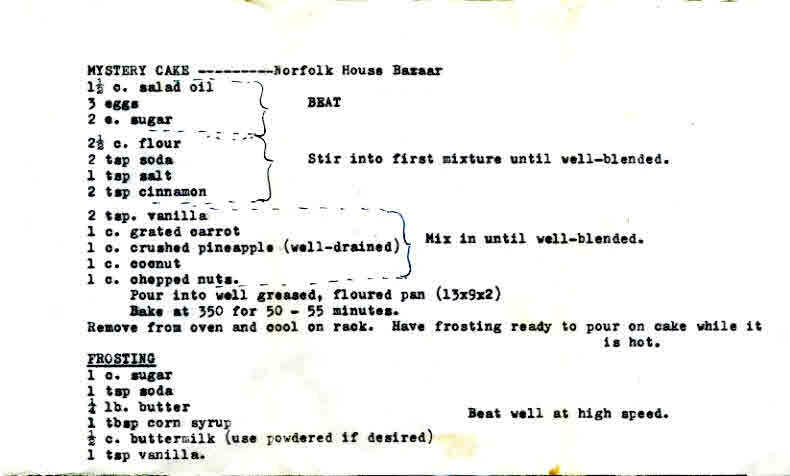 An internet search revealed a recipe for making a very different sort of bread in just such a pot – from the NY Times. 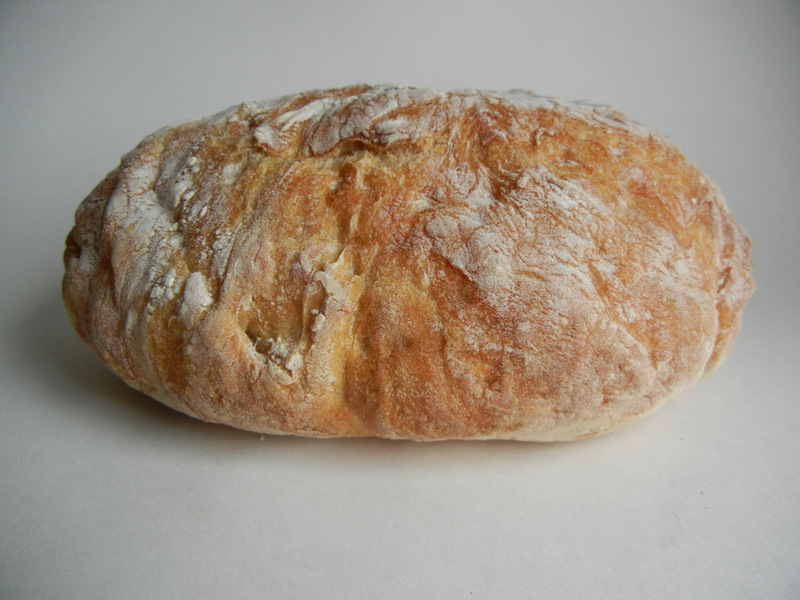 It’s no-knead bread, and so far we’re very impressed with the results. I’ve also make a loaf of regular rye bread in this pot, and it rose much better than any rye I’ve ever baked in the oven.This has to do with two main factors: putting the dough into a hot pot, and baking with a lid on. The lid traps the moisture that ordinarily escapes from the bread in a normal oven, and this contributes to the initial rising and superior results in texture and taste. 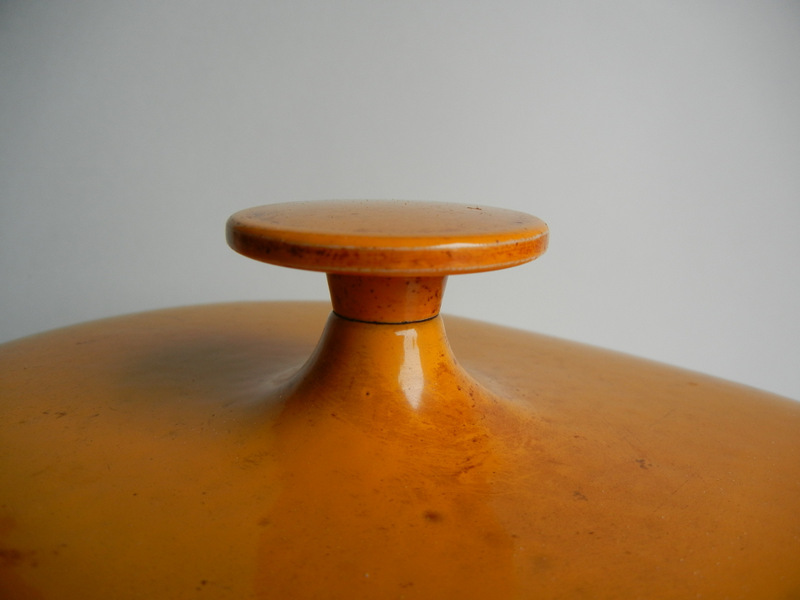 In 1972 Le Creuset hired Enzo Mari to design this particular line of pots. I love finding beautiful things like this, and who was responsible for their design. 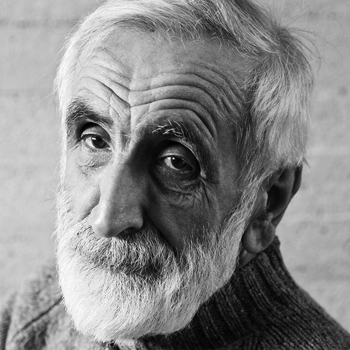 Mari is one of a long line of Italian modernists, responsible for countless beautiful objects of which I am surprised and happy to have discovered one more. One thing I realized after all this – if the pot had not been cracked we might not have discovered this wonderful way to make bread. Ergo: crackpots have their uses! No offense, Enzo, I’m referring to the pot.